When most people travel to Germany, they want to try beer, pretzels, schnitzel, and sausages. 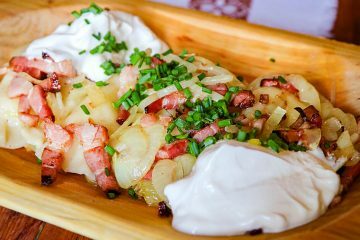 While you can find these things in the country’s capital, you’re better off exploring international food in Berlin, a city that has been attracting people from all over the world for many decades. After World War II, Germany needed workers to rebuild and sought help from outside its borders. The West attracted people from Turkey, while the Soviet-controlled East attracted people from Vietnam. The ways these two groups added to the cultural landscape can easily be seen in Berlin. Even today, decades after the Berlin Wall came down, you can still find more Turkish descendants on the western side of the city and more Vietnamese descendants on the eastern side. This of course means lots of tasty Turkish and Vietnamese food! But with people from almost every country in the world calling Berlin home, you’ll also find great cuisine from almost any country in the world. I’ve recently made it my mission to try at least one restaurant in Berlin for every country in the world, and here’s some of what I’ve found so far. 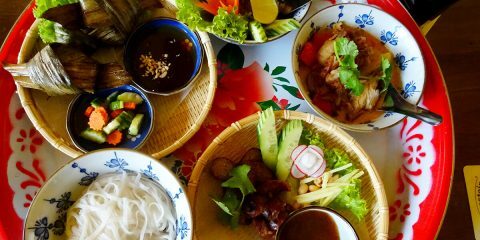 You’ll find plenty of Thai restaurants around Berlin, but the most unique place to go is Thai Park. The official name of the park is Preußenpark. Over the past few decades, Thai families have gathered here on weekends to have picnics with their friends and families, and it has become known as Thai Park. Somehow it evolved into an unofficial market where people buy cheap and tasty Thai food cooked right in front of them. It’s best to look for stalls where you actually see the vendors cooking. Order your dish and watch it being prepared, but avoid the stalls where food is already made and sitting out. There are also stalls selling drinks, both alcoholic and non-alcoholic. The market mostly takes place on the weekends when the weather is good. Take the U2, U3, or U7 to Fehrbellinerplatz. Follow the path through the park until you start smelling the food and seeing tons of umbrellas and people with picnic blankets. Left: Beef Pho from Hoai Nam. 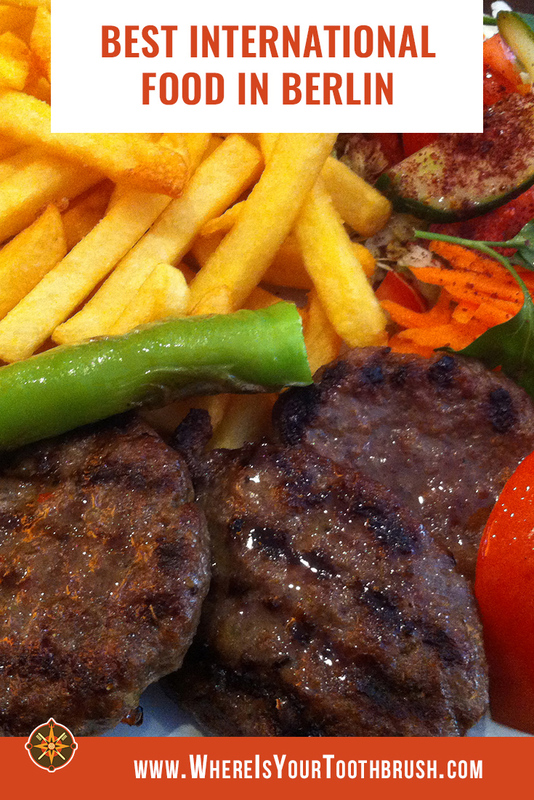 Right: Kofte with fries and salad from Bal. Mostly what you’ll see around Berlin are restaurants selling doner, and most are mediocre but tasty enough for the price. If you want truly good Turkish food, you have to dig a little deeper. One of my favorite places is a tiny little restaurant in the Kreuzberg neighborhood called Bal Köfteci. They only have a few tables, but it’s worth it. One of Bal’s specialties is kofte, which are little seasoned meat patties, and my personal favorite. But I also enjoy the simplicity of the restaurant. I love that such a small place can thrive, and that they’re family-run. Take the U8 to Schönleinstrasse. Find Bal at Kottbusser Damm 101. Bonus: Go for lunch on a Tuesday or Friday, and either before or after you eat go check out the outdoor Turkish market a block over on Maybachufer. Directing you to the best Vietnamese restaurant in Berlin is tough. There are so many Vietnamese restaurants that there’s a spot near where I live with four within 50 meters! One of my favorites is called Hoai Nam in Kreuzberg. Like with Bal, the simplicity results in really good food. Hoai Nam is primarily a soup restaurant, so they serve good Pho as well as a handful of other soups. Their menu also includes a few other things like spring rolls and salads, and they have three daily specials that are often rice-based dishes. It’s a small menu, but the food has big flavor. Take the U1 to Görlitzer Bahnhof. Find Hoai Nam at Skalitzer Strasse 103. Bonus: For another interesting experience a little outside the center of Berlin, check out the Dong Xuan Center at Herzbergstrasse 128-139 in Lichtenberg. It’s a big complex of warehouses that sell mostly Vietnamese food supplies and other items. You’ll also find a few restaurants there worth trying. 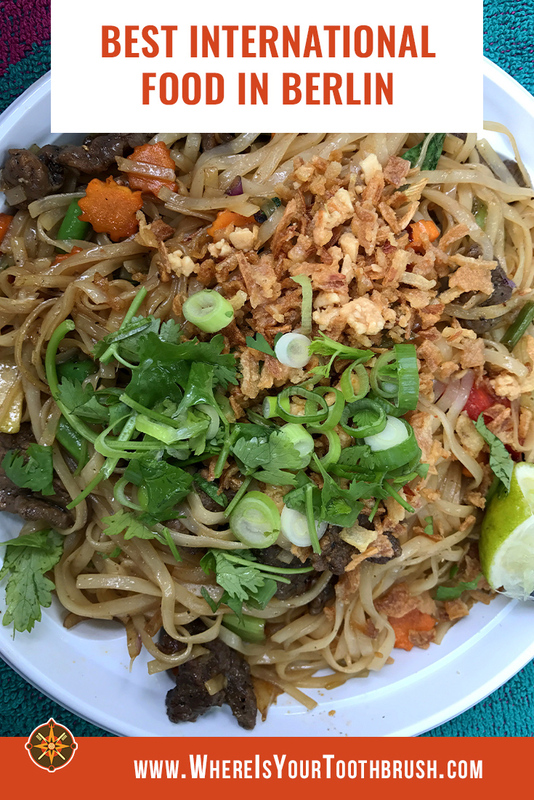 Left: Tasty beef and noodle dish from Thai Park. 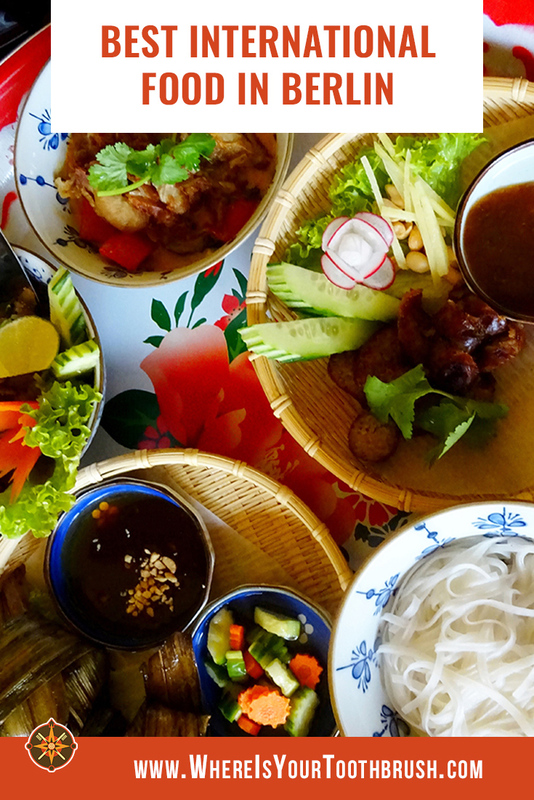 Right: A combination of Lao and northern Thai dishes from Hangmee, perfect for trying lots of things. If there’s a specific type of cuisine you’re interested in, you can probably find it in Berlin. Aside from plenty of Turkish, Thai, and Vietnamese restaurants, there are lot of others to sink your teeth into. I’ve tried several different Korean restaurants in Berlin, and one that I quite like is called Angry Chicken at Oranienstr 16. It’s decorated in bright neon colors and offers fried chicken at various spice levels. Their bibimbap also has a nice kick to it. Hangmee, at Boxhagener Str. 108, technically serves food from Laos and northern Thailand. 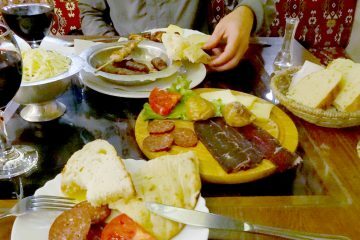 The portions are small, almost tapas style, which means you can try several different things and share. This has become one of my favorite restaurants in Berlin because the flavors are so interesting. This is my all-time favorite cuisine, so I’m still on the hunt for a Mexican restaurant in Berlin to call the best. Serious contenders include Santa Maria, at Oranienstr 170, for classic tacos, burritos, and quesadillas, and Santa Cantina, at Simon-Dach-Str 22, for a few interesting twists on the classics. It’s impossible to know for sure without trying the food, but there are a few things to look out for that will help you find a good restaurant. Simple is better. Look for small to medium sized menus, and skip the places with mile-long menus. Restaurants that specialize in a handful of dishes will generally make them really well. Skip restaurants that serve several different types of cuisine. For some reason, lots of Asian restaurants think they need to serve sushi, and I often see Vietnamese (and Thai) restaurants with sushi on their menus. I also know of a restaurant that serves both Italian and Mexican food…that can’t be good. These restaurants are trying to be too many things and usually don’t make any one dish really well. Go to restaurants where the food, not their happy hour, is the focus. Plenty of restaurants advertise their cheap cocktails and all night happy hour specials on big chalkboards on the sidewalk, but in general their food is mediocre. Avoid restaurants that are too close to the major tourist attractions. As in most cities, there’s a high chance food near touristy locales will be overpriced and unremarkable. With the extensive public transportation network, it’s easy enough to get to better food after your sightseeing. 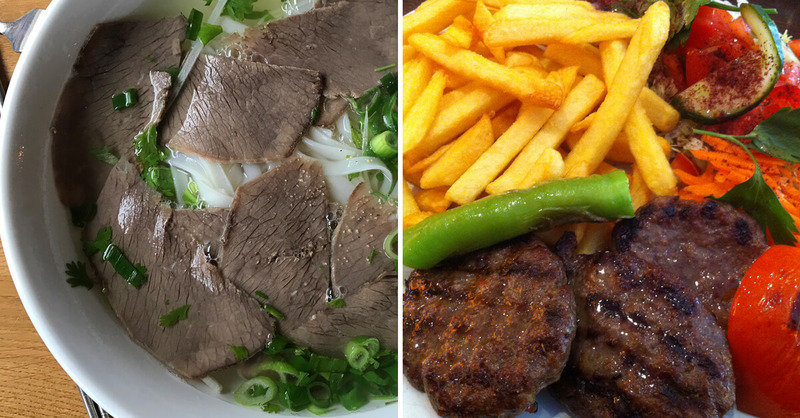 Have you had any international food in Berlin? Ali Garland is originally from the US but now lives in Berlin. After years of trying to fit everyone else's expectations, she now makes up her own rules. She's addicted to traveling, always goes carry-on only, and loves trying new food. 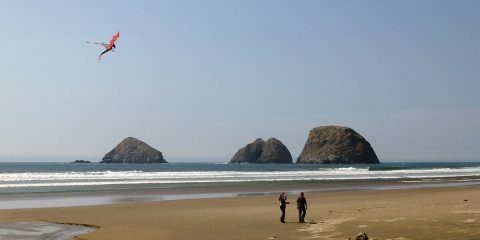 You can find her at Travel Made Simple and Ali's Adventures as well as on Facebook and Pinterest. This is such a great resource. You always assume you have to have a certain kind of food when you’re visiting a foreign city but it’s important to remember you can find amazing restaurants of some of your favorite international genres. Berlin is an especially good city for that. Absolutely, Lois. We were quite surprised—though we really shouldn’t have been—that Berlin has such a great international food scene. This post was so interesting to read. I never knew about the emergence of Turkish and Vietnamese cuisine as a result of workers to rebuild after the war. Your tips at the end are so true with respect to choosing a restaurant – always far better to choose a place that focuses on few specialist options and does them well. Just love the clarity of your photos. Looking forward to visiting Berlin all the more now. DDR wasn’t the only Eastern Bloc country to see an influx of Vietnamese people during Communist Party rule, but not everywhere did a food scene emerge (I’m thinking of Czechoslovakia, where I was born). This is such a cool idea to try. I’m sure it’s not just Berlin but most cities have authentic international cuisine restaurants that enable you to sample delicacies from all over the world. Out of all these, Vietnamese is the only one I haven’t tried so I am most curious to try that! 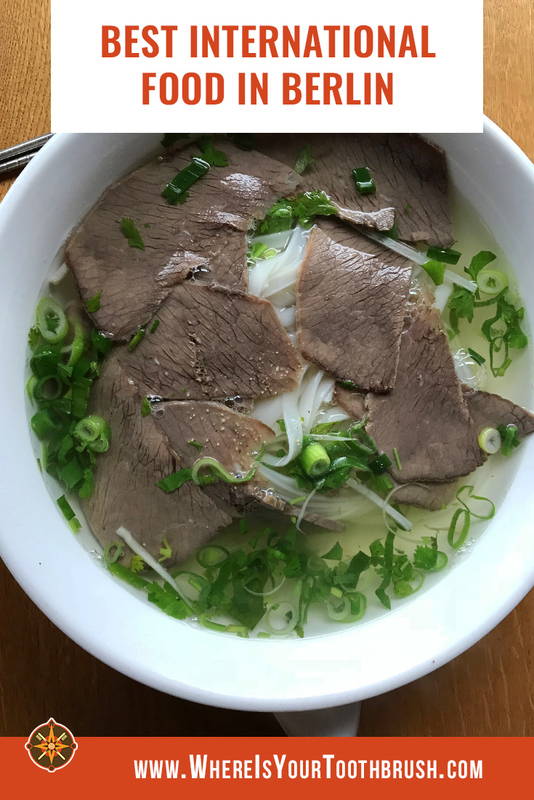 A classic Vietnamese Pho is something I’ve always wanted to try! Aside from being a delicious, hearty soup, pho is a great cold and hangover medicine. We have yet to visit Berlin, but if Ali’s info is any indication, we’ll love eating our way through the city. 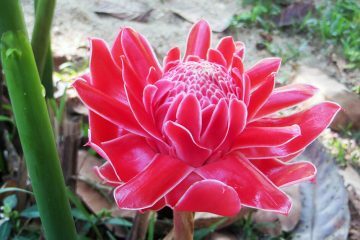 That’s wonderful blog. I never saw Berlin as a food destination. I have never tasted Laotian or Korean cuisine. Hope they have vegan versions available as well. Did you also find good Indian food in Berlin? I don’t know a lot about Indian food, but what I’ve had was good. That said, most people who do know Indian food say that Berlin does not have good Indian. As for vegan, Berlin is a wonderful city for vegan and vegetarian food, as well as finding places that serve gluten free and/or dairy free options sometimes. I haven’t been to Berlin yet but it’s good to know there are so many international food options there! Whenever I’m in Europe I always have a massive craving for Asian food (I’m Asian haha). This is gonna come in handy when we go to Berlin one day! We haven’t been to Berlin either, but Ali is making the decision to go easy. Ive only been there once, already 10 years ago. And yeah, you typically go for the “German classics”. 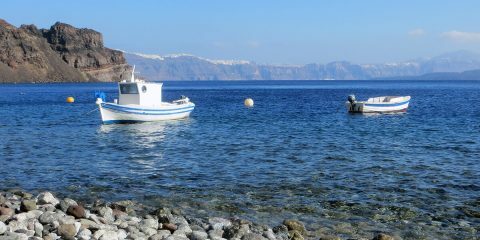 But we are planning another trip, and this post will help us a lot to find some variety in food. 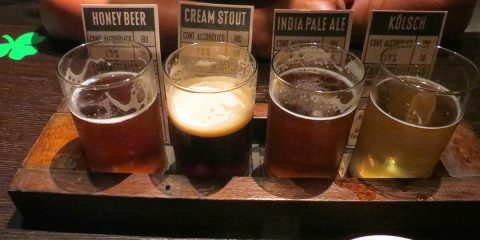 For great craft beer, Muted Horn is just one of the many new places in Berlin ! Wow. Berlin looks a home for all. It’d be interesting to travel just for this sole reason alone. I’d not mind visiting all of these places if not to eat but to tour. I’m glad there is Korean cuisine too. Your tips would be sure useful when I visited Berlin. Wow, a variety in Berlin! I love that you have recommendations for each cuisine, like what is BEST compared to those mediocre restaurants where you can get your fill. Wishing you luck on your hunt for the best Mexican food! One of the best things about this list is the fact that you offer tips to actually GET to each of these restaurants. Half the time, the toughest part is trying to figure out how to get to lunch or dinner from your previous activities. Plus, I had absolutely no idea that there was such a Thai presence in Berlin! So true, sometimes the logistics get lost in the review shuffle. 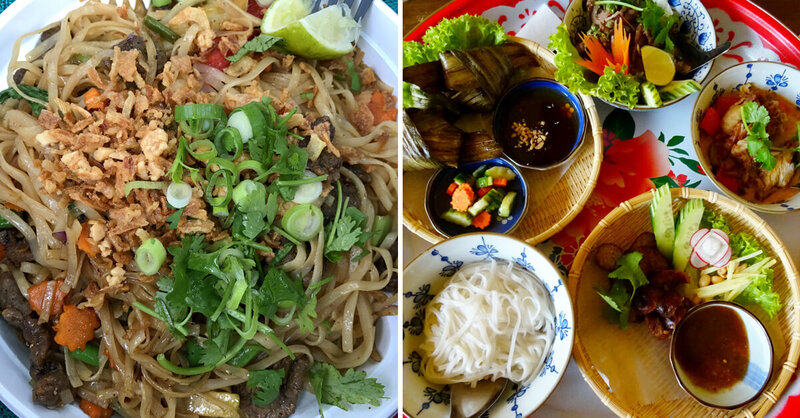 Simple instructions on how to find good Vietnamese, Thai, Mexican or Turkish food — very helpful! I was surprised to learn of the Vietnamese and Turkish influences in Berlin. Thanks for the post…I’ll certainly consult it when I visit Berlin! That is quite an interesting post for the food lovers especially the ones looking for varieties. And after reading this the first question popping into my head is – Is there any option for veg, non-veg Indian food in Berlin? Anyways it will be quite handy while traveling to Berlin. Thanks for sharing. Ali says Indian food in Berlin isn’t on par with other cuisines, see her comment above. Good tip on visiting specialist restaurants as opposed to one who serves everything. Had never really identified Berlin as a place where cuisines from around the world were prevalent. With the world becoming more and more open and travellers crossing boundaries more frequently, availability of multi-cuisine proves a boon not only to the travellers but also the place. I was looking for Indian food, in your list and could not find any, so I did my own research and did come up with a couple of options. Berlin is very international in itself so no wonder that there is food from all around the globe. 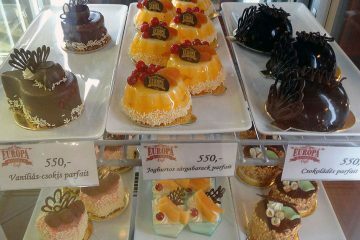 Of course, if you are searching great Turkish restaurant and you have selection of 5000, it is hard to pick one. I can never ever decide:] I appreciate your food guide, it is an amazing time saver. Indeed. We just follow the crowds – go where the Turks go. What a great round up. I fell in love with Korean food when we were there this year so would be tempted by that option, as I dont really know of any such restaurants near where I live. I’d go to all of these just to bring back memories of traveling to those places too. We didn’t specifically seek out international food while we were in Berlin, but I remember we did eat quite a bit. I remember that our first night in the city we ate at a small yet tasty thai restaurant across the road from our hotel. Yeah, international food isn’t something that comes to mind first when you visit Germany. But thanks to immigrants and all their good food, it’s high time to change that perception. Interesting that the international cuisine is also very good there. That was exactly my association, Kirstie. Thanks to Ali, now I know better. Thanks for the tip about how simple is usually better when looking for foreign food. It would be smart to consider how authentic the shop or restaurant feels before you choose it. In addition to this, you could probably read past customer reviews in order to get a feel for how others feel about the food in question.